. . .I see it all," said the elder brother. "I think I know all about it. But running away is not the thing. One may be pretty nearly sure that one is right when one says that a man shouldn't run away from anything." "The thing is to be happy if you can," said Arthur. "No;—that is not the thing. I'm not much of a philosopher, but as far as I can see there are two philosophies in the world. The one is to make one's self happy, and the other is to make other people happy. The latter answers the best." "I can't add to her happiness by hanging about London." 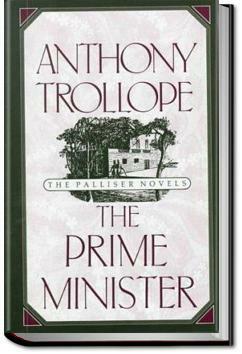 I didn’t mean to read ‘The Prime Minister’ quite so soon, or to rush through it quite so quickly, but I had to step back into Trollope’s world because there seemed to be so many old friends I wanted to see again, so many interesting new people to meet, so many intriguing things happening.